A Panlantic in GTA III. The Panlantic is a van featured in Grand Theft Auto III and Grand Theft Auto: Liberty City Stories. The Panlantic is a variant of the Pony. However, like the Toyz, the Panlantic features flat side-body panels and the Panlantic Construction Company brand and logo on its sides; the van is also consistently painted gray in GTA III, and white in GTA Liberty City Stories. Other than the differing body design, the Panlantic is no different from the Pony in terms of performance: it is moderately fast, corners poorly, and becomes damaged easily. A Panlantic in GTA Liberty City Stories. 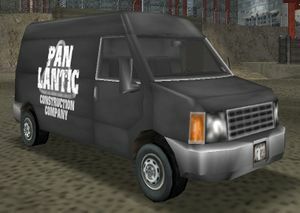 Due to its affiliation with the Panlantic Construction Company, the van is typically only seen parked in construction sites; specifically, Panlantic's Fort Staunton construction yard in GTA III. 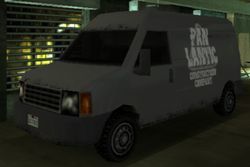 The van is also allegedly used by Colombian Cartel members in GTA III, as is the case in "Grand Theft Aero", in line with allegations that Panlantic is a front for the Cartel. This page was last modified on 20 July 2012, at 14:13.